The Welsh international hasn’t played since September. 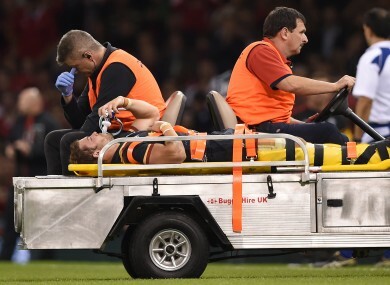 Leigh Halfpenny leaving the field on a stretcher during Wales' World Cup warm-up match against Italy last September. LEIGH HALFPENNY IS set to make his first appearance of the season for Toulon in their Top 14 semi-final clash against Montpellier on Saturday. Toulon manager Bernard Laporte announced on Friday that the Wales international full-back will line up for the crunch encounter despite not having played for nine months. “He will play, for sure,” said Laporte in a press conference in Rennes, where both Top 14 semi-finals will be played. “He was supposed to play four or five times already but every time something was wrong — one time it’s the meniscus, another it’s the hamstring. The 27-year-old tore his cruciate knee ligament against Italy in Wales’ final warm-up match ahead of the World Cup last year. Several times since he has appeared to be on the brink of a return to action, only to break down in training. Halfepenny’s inclusion will be a boost for the 2014 champions in terms of his impeccable kicking off the tee, but also brings with it a degree of uncertainty given that he has yet to feature alongside his team-mates all season. “We’ll see how long he lasts,” added Laporte, who said Halfpenny would likely tire in the last 20 minutes “depending on the intensity”. The other Top 14 semi-final sees last year’s beaten finalists Clermont play Racing 92, who lost to Saracens in the European Champions Cup final last month. Email “Leigh Halfpenny to return from nine-month injury nightmare in Toulon's Top 14 semi-final”. Feedback on “Leigh Halfpenny to return from nine-month injury nightmare in Toulon's Top 14 semi-final”.